The durable, stain resistant and washable matt was specified in order to achieve a high class finish that will last for years to come, with the Johnstone’s team carrying out the work over evenings and weekends. Nevin of Edinburgh decorators were contracted to complete the building’s transformation and the team of 20 also painted a specially commissioned mural designed by Scottish artist, John Byrne. Nevin’s work at the theatre recently won them an award in the Period and Restoration category at the Johnstone’s Painter of the Year 2013 awards. 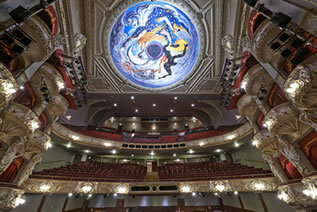 King’s Theatre was opened in 1906 and stages a variety of shows and events, including the Edinburgh Festival.